BEAM Central Vacuum Systems by Electrolux have been rated by builders and contractors as the highest quality central vacuum systems. The ratings are the result of Builder magazine's annual survey of readers to determine builders' preferences for brands in more than 100 different product categories. Read more. 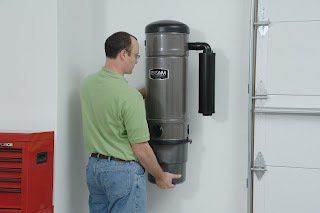 Tens of thousands of homeowners have enjoyed years of reliable deep cleaning performance from their BEAM Central Vacuum Systems. It's not uncommon for a system to outlast three upright vacuums. Keeping your system in tip top shape year after year only takes a few minutes. 1. Empty your collection receptacle regularly. If the bucket is full the system won't perform at its optimum level. Typically the bucket should be emptied two or three times a year -- probably more if you have pets. Some homeowers will wrap a plastic bag in the bucket wrap and shake the permanent cloth filter into it to remove dust that collects on the outside of the filter. 2. Also make sure the inside of the bucket remains dry. It's okay to wash the bucket with warm soap and water after you empty it. But make sure the bucket is completely dry when you reattach it to the power unit. That will prevent any mold from forming in the bucket. And it will prevent freezing if your your power unit is installed in the garage. 3. Clean out your tubing system. Your BEAM dealer can provide you with tacky cloths called Tornado Power. Simply vacuum one into the system at each inlet valve. The cloths will remove any dust that may cling to joints in the tubing.